Amadouny, Vartan (2012). 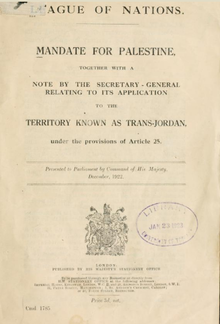 "The Evolution of the Transjordan-Iraq Boundary, 1915–40". In Clive H. Schofield and Richard N. Schofield. The Middle East and North Africa: World Boundaries. Routledge. ISBN 978-1-134-88028-7. Louis, William Roger (1985). The British Empire in the Middle East, 1945-1951. Retrieved 26 Feb 2012. Sykes, Christopher (1973). "Crossroads to Israel". Indiana University Press. ISBN 0-253-20165-9. Retrieved 2015-06-04. Renton, James (2016). 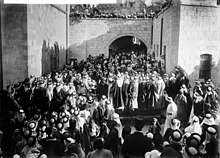 "Flawed Foundations: The Balfour Declaration and the Palestine Mandate". In Miller, Rory. 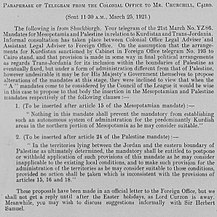 Britain, Palestine and Empire: The Mandate Years. Routledge. pp. 15–37. ISBN 978-1-317-17233-8.